J. Bruce Morton has served as a Professor in the Department of Psychology at the University of Western Ontario since 2002 and is now a faculty member of the Graduate Programme in Neuroscience. Dr. Morton’s research interests concern the development of cognitive control and its association with changes in prefrontal cortex function. One of the foremost challenges for young children is organizing their thoughts and actions in the service of achieving long-term goals. 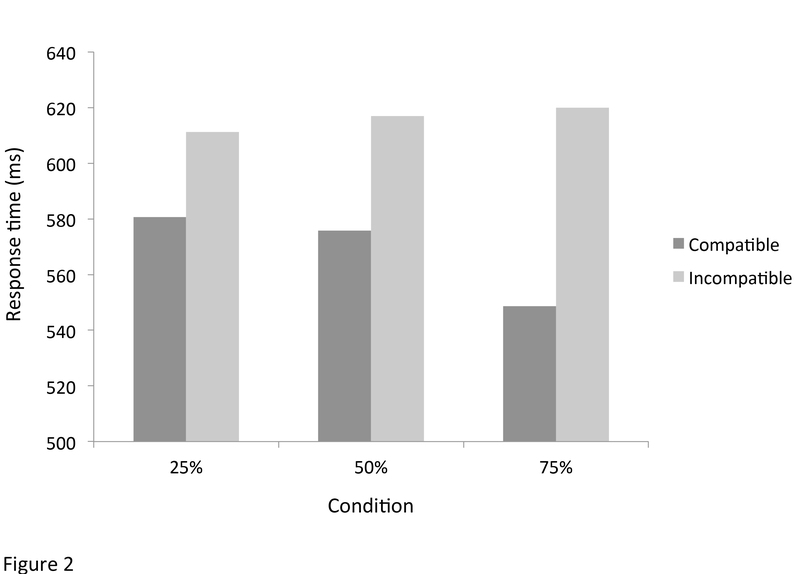 Children find it difficult to defer small immediate rewards in favor of larger future rewards for example, or to switch the focus of their attention from one feature of a stimulus to another. The development of such self-regulatory capacities is an important foundation for later academic, social, and health-related outcomes, and is therefore the focus of many basic and applied research programs. Research in Dr. Morton's Laboratory aims to associate developmental and intra-individual variation in self-regulatory abilities in early childhood with various experiential and constitutional influences that are at play in the lives of normally developing children. 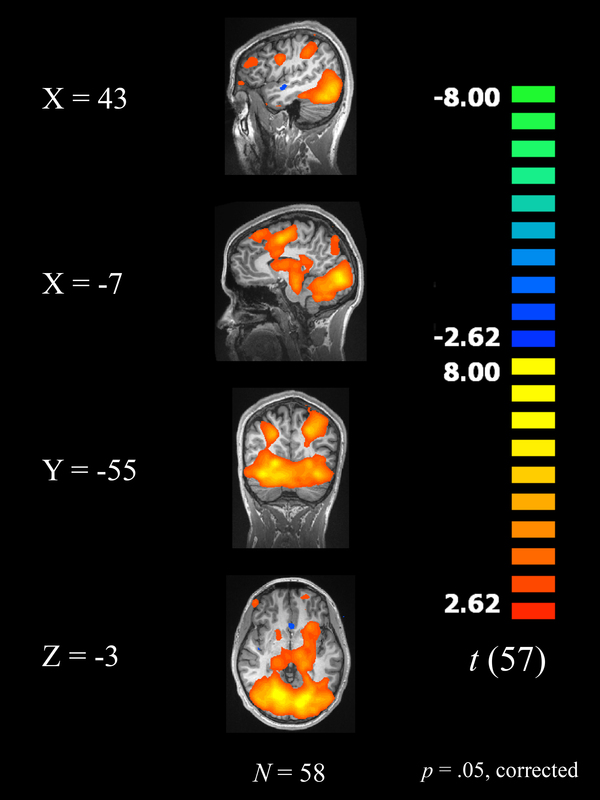 Using functional magnetic resonance imaging (fMRI) and electroencephalography (EEG), for example, they have identified age-related changes in the organization of broad-scale cortical networks that support mental flexibility and rapid adjustments in control (see results below). Building on these insights they are beginning to probe genetic influences on the function of these networks in early development, by examining the association of polymorphic variations in dopaminergic and serotonergic genes with patterns of brain activity observed during reward-based learning and decision-making. At the same time, they are keenly interested in larger experiential influences on the development of self-regulation, including training, socio-emotional upbringing, sleep, and multi-lingualism. The long-term objective is a comprehensive understanding of how genetic and experiential factors interact in the development cognitive and behavioral self-regulation. In recent studies, Dr. Morton and his students investigated cortical regions associated with rapid adjustments in control and their development. 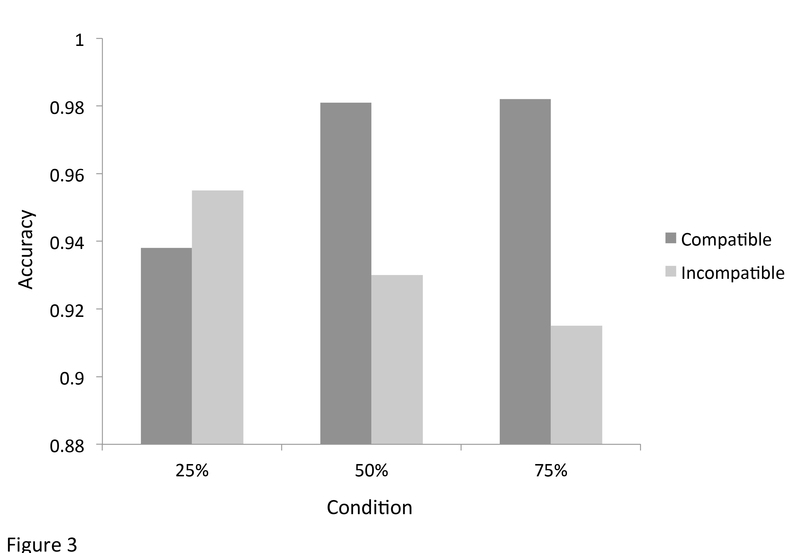 Participants ranging in age from 9 to 32 years selected the numerically larger of two digits. In a 25% compatible condition, selection was made easier by the physical size of stimuli but only 25% of the time. Participants therefore needed to be ready to deal with conflicts in advance. By contrast, in a 75% compatible condition, selection was made easier by the physical size of the stimuli 75% of the time. Participants therefore had to rapidly adjust to conflicts as they arose. An additional intermediate 50% compatible condition was also included. See Figures 1 - 5 below. 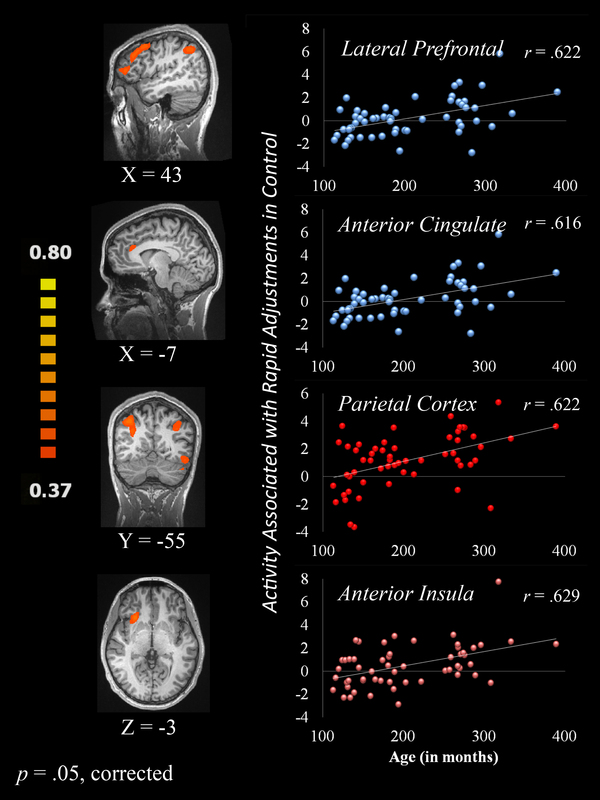 Brain regions more robustly activated by rapid adjustments in control in older as compared to younger participants, including lateral prefrontal cortex, anterior cingulate cortex, intra-parietal sulcus, and the anterior insula. Ezekiel, F., Bosma, R., & Morton, J. B. (2013). 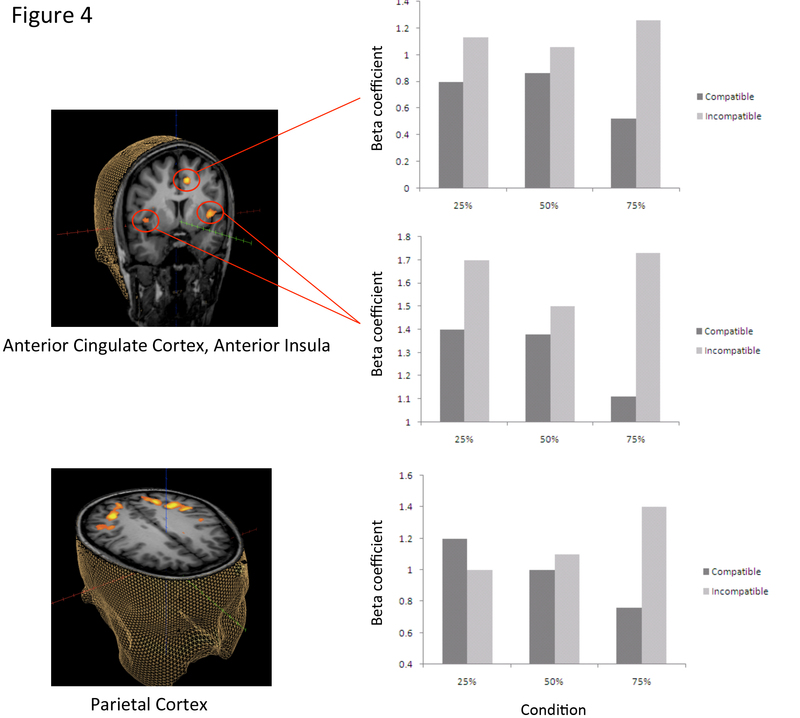 Dimensional Change Card Sort performance is associated with age-related differences in the functional connectivity of lateral prefrontal cortex. Developmental Cognitive Neuroscience. Wilk, H. A., & Morton, J. B. (2012). Developmental changes in patterns of brain activity associated with moment-to-moment adjustments in control. NeuroImage. Waxer, M., & Morton, J. B. (2011). 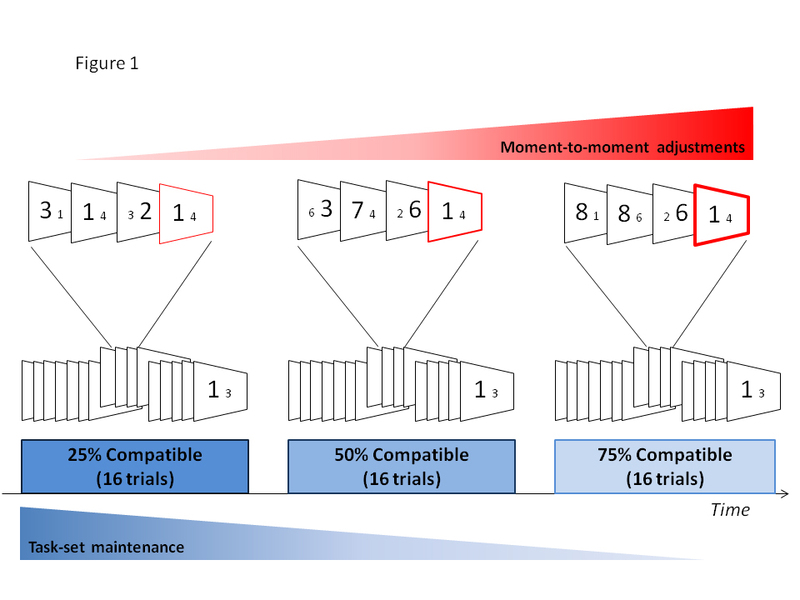 Multiple processes underlying Dimensional Change Card Sort Performance: an electrophysiological investigation. Journal of Cognitive Neuroscience. Waxer, M., & Morton, J. B. (2011). The development of future-oriented control: an electrophysiological investigation. NeuroImage. Morton, J. B. (2010). Genetic, neurophysiological, and experiential influences on the development of executive functioning. WIREs Cognitive Science.